Try not to eat the whole thing! 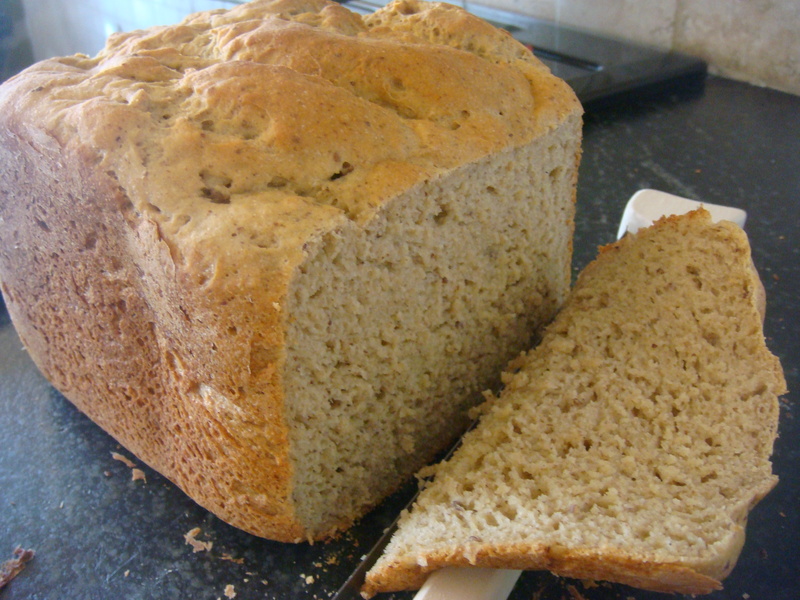 I have been making my whole grain, gluten and dairy free bread for a couple of years now. Last June I finally posted my recipe with detailed instructions. That recipe is far and away my most visited post. That makes me happy! The hardest part of being gluten free is trying to stomach gluten free rice based “bread”. I still make this once or twice a week. But as time has gone by I have started making some changes. The recipe is still basically the same but I have started making it a bit simpler with fewer ingredients. The result is the same. I still end up with the best tasting bread I have ever had. I just made some this morning and for lunch had a slice of it, still warm, dipped in olive oil with minced fresh rosemary, kosher salt and fresh ground pepper. Bliss! Anyway, here is what I am doing now. Want to try something a little different? How about GF Cranberry Pecan Bread? The directions are the same as in my original recipe. I don’t always take the time to sift but you get a better blended loaf if you do. I also add a few more flax seeds and sesame seeds to the top of the batter after I pull the paddle out of the bread maker just to make it prettier although I didn’t do that in the loaf shown. I am also told that this bread can be done with egg replacer if you are allergic to eggs. It can also be done completely rice free or not depending on what you want. The recipe is really flexible. Try this. Eat and be happy! *** Most bread recipes tell you to heat your liquid to body temperature for the benefit of the yeast. If you do that you also have to make sure the rest of your ingredients are room temperature. I hear of other gf cooks waiting around for their eggs etc to come to room temp before baking. When I make this bread I do it in approximately 5 minutes, start to finish. So I heat my water until it’s really hot but not boiling (1.5 minutes in the microwave). I use eggs right out of the fridge combined with the rest of the wet ingredients and add the water. I have never had a problem with this method. By the time the yeast actually comes in contact with the liquids everything is the right temperature. The possibility of scrambling your eggs does exist though if your water is too hot. This woman rocks when it comes to bread recipes!!!!!!!!!!!!! Thanks Steph,I find this comment funny. Ironic funny. Before CD I had tried making regular bread so many times. Every single time it turned out like a brick. Completely unedible. Then CD comes and I work out this recipe and it works. Ironic. RachelThat is funny about our blogs. They really are similar. I read some of yours but how do I access your archives? Where do you live? How old are your kids? Do you have recipes too? Let me know if you try my bread recipe. I am always interested in hearing how it turns out for others. Kim – my archives can be accessed on the right side of the page. I have posted a few recipes which can be found by clicking on the gluten-free category in the archives on the right. I live near San Diego, my kids are 4 and 1. Where do you live and how old are your kids now? I'll let you know if I try the bread. Gotta come up with an egg sub. Rachel, when I go to your blog the right sidebar is empty. I can see none of the usual things like archives, labels, profile etc. We were just in San Diego a couple of weeks ago and I was trying to convince my husband that we need to move there. We go there a couple times a year. It's where my husband proposed to me. Send me your email so we can chat! Is teff flour a suitable substitute for rice flour in all cooking? I am also allergic to rice and cannot find many bread or dessert recipes without rice flour. I have substituted teff in all recipes that call for brown rice flour and have never had a problem with it. I don’t even buy brown rice flour. Now, if the recipe calls for a white rice flour, the texture of that is so fine and powdery that I don’t use teff there. The teff has the texture and density of brown rice flour. Have you ever tried teff before? I love love love it! Is teff flour the same as teff grain? Teff flour is made out of teff grain. Teff grain is the smallest grain. It looks like coarse sand. It needs to be ground to bake with it. If it is the whole grain you have it works as a hot cereal. Hope that helps. I just have to tell you that your bread has just about changed our lives!!! I have 3 kids on the autism spectrum and we are doing and casien free. We have bought several different types of bread aka bricks, and I have made more loaves from different recipes than I care to count with no success. Then I found yours!!! LOVE LOVE LOVE this bread! I have substituted different flours, added a little more honey, added chopped up sunflower seads, you name it, I’ve been doing it to this bread, it always works and tastes like real bread! You’ve saved my life! This kids aren’t complaining anymore, my husband eats half a loaf with vegan butter substitute straight out of the oven, it’s just amazing! Also, I don’t use a bread machine and double the recipe to make about 8 loaves a week. If I wasn’t beating people off of it with a stick, I’d have to make more! Thanks again, you can just call me your disciple from now on! I can’t tell you how happy this makes me. I often think about closing my blog to the public and just when I am about to do that someone leaves a comment like this. I know how frustrating it is to feed kids. It is so great to hear that they like this bread. I too think it is the best, hands down, but I am a bit partial. Udi’s bread was all the talk on a celiac message board I am part of and EVERYONE raved about how awesome it is and how it is just like wheat bread and it can sit out on the counter and it is soft, blah blah blah. I was interested in trying it just so I could compare. It was the best gf loaf of bread I have ever bought but it was still gross and had to be toasted. My kids hated it. It really flabergasts me that people won’t just make their own. I just don’t get it. How did you come across the recipe? My blog is so small and I can’t be regular about posting and I don’t promote it at all so I am always interested in hearing how you happened to find it. How long have you been using the recipe? Oh my goodness! I JUST found your blog. My son has just recently been put on a GF diet (we’ve been DF for awhile with not much relief) and are in the process of confirming a celiac diagnosis for him. He also doesn’t eat meat by choice and not too many veggies (like most 6 yr. old boys). Your website & blog is the first one I have found that is not some over-the-top-ultra-strange-foods website that makes me feel worse and more frustrated. Thank you for making me feel ok that since we have went GF I have been frustrated in the grocery store, in my kitchen, and in my child’s school. I just read the post that you are considering shutting it down. Please don’t! I’m so happy to hear that you have found the stuff here helpful. I too remember those first days of being GF and being overwhelmed by ingredients I have never heard of. Wow, no gluten, no dairy, no meat and few veggies! Now that sure makes for a limited choice of foods. No kidding you are frustrated. Who wouldn’t be! Good luck with your son and getting an accurate diagnosis. Sometimes just knowing what the problem is half the battle. Thank you, Kim, for this recipe and for not closing your blog! I surprisingly found this recipe looking for Udi’s bread coupons on Google. My 7 year old son (middle kid of 3) is allergic to eggs, wheat, dairy, and the allergist told us last week- soy, plus a ton of environmentals… Our oldest (9 year old super-girl) has no allergies or health issues, and youngest boy (who’s 3) can’t tolerate dairy. I was totally overwhelmed with the news, and now that I found this recipe, I am eager to try making “real” bread. Sorry about the delay. How are you doing with the diet? It is so overwhelming in the beginning. I’ve been there. It does get easier. I promise. Let me know if you make my bread eggless. I’ve done it. It’s a bit denser but tastes great and is moist. I think I used the flax goo as a replacement but if you have egg replacer at home I’d love to hear how that turns out. Good luck! I sure wish I could remember (or find) the site that led me to you. I was in a kinda desperate gluten free bread haze when it happened. I do remember that the young lady that wrote the blog had a little on and a lovely picture of a big ol’ sandwhich and she raved on and on about your bread. I of course knew I had to check it out. I’ve been using the recipe for about 3 weeks now and knew after the first loaf that it was the one for us. We are only about 2 months into this diet, and to say it has been frustrating is an understatement! I am checking out your other recipes and am so excited to see the results! Thanks again! I made this bread with quinoa instead of sorghum , and hi -maize resistant starch instead pf potato starch and it was great……would like to try it with much less honey as I am not a fan of sweet breads. I also had to tweak this bread as I live at 3500ft (hi altitude) above sea level with no humidity .I am in calgary ab canada. I am a low carber so I got 2 loaves out of this bread also. now I would like to substitute an even lower carb flour thats GF to take down the carbs , but I am at a lost….any suggestions? I’m originally from Edmonton. Funny. Anyway, glad you liked it. Does the carb count vary greatly from grain to grain? I too try to lower my carbs so I just eat a lot less bread than I used to. What do you mean you got 2 loafs out of it? I have a friend who has subbed in some coconut flour and liked it. It is really low carb as most of the carbs are in the form of soluble fiber. Besides, it’s considered a nut not a grain. It does absorb more water so you’d have to play with the liquid amount. Sorry I can’t be of a better help. I’d love to see how you tweeked it especially if you manage to lower the carb count more. BTW; I have moved my blog. This one will eventually be closed down. All these recipes on this site are now at the other site. I am at http://www.gfrealfood.com I hope you’ll join me there. I have calculated the carbs at amount of grams for each cup of flour/starch. Then I got 2 loaves (i split up the dough) as I got a better rise (not so heavy)…had done the same with GF French bread from a friend, who suggested that I divide the dough up for ease of rising, so I tried the same here and it really helped! The high altitude has been an education for me so I consulted with the book Pie in The Sky for high altitude cooking and it had the things to do at my altitude. i am thinking of the coconut flour you mentioned and the carb count is about 65g per cup , then again it is a very high fibre flour/digestible carbs lessened, but not so much as the hi maize. It is worth it to google the above flours like I have done to understand the carb counts. In my experiment with this loaf, I forgot to add the boiling water on the bottom shelf, which gives a much improved loaf….so I will next time, when I test with much less honey, as I believe, I need only about 1 tablespoon of honey for the tablespoon of yeast I used…..This will also reduce the carbs. Awesome tips. Thanks so much for posting. I have never heard of Hi maize corn starch. Where do you buy it? Online? I have only done this once in the oven. Next time I do, I will try it as two loaves. Again, thanks so much! No need to apologize. Glad you made it over here. If I knew anything about computers I would just map that domain over here. However, I’m clueless and I don’t have time (or desire) to figure it out. I buy hi maize 260 from King Arthur or Honeville(good explanation) online as I cannot get it in Canada (also high shipping costs–i had it delivered to a friend in New Jersey , but still expensive–i ordered 10lbs as a result!). 10 lbs is nothing. Last week my husband came home with FIFTY pounds of whole millet and FIFTY lbs of whole flax seed. Glad he has such faith in my ability to figure out what to do with that but…. Thanks for the info. I need to check that out. I’d love to lower the carb count of this bread. Word is spreading about your bread, I look forward to trying it this weekend. I am so happy to hear that. How did you come across it? 1) how would you describe the different in taste between the ivory or dark teff flours? 2) would you recommend sorghum flour over buckwheat flour (which I already have in my pantry) for a better texture? 3) would you consider working on a pizza crust recipe–pretty please? That was the other item that Udi’s sells that really interests me. Keep up the great work, and thanks for all your efforts and enthusiasm! 1) As for the teff, I like them both but the ivory is milder in flavor and the dark makes a very dark looking loaf. Think pumpernickle. In general though, in case you haven’t used teff before, it is a very mild tasting grain. 2) I think for texture it really depends on how finely ground the flour is. I say that because as I write this I am in Canada visiting family and I have had issues with my bread. I am using the same recipe I always have and yet the loaves have come out dense, dry and heavy. Honestly, it reminded me of the dreaded store bought rice bread, just with better flavor. When it happened with the first loaf I used dark teff and millet. I checked both after the fact and noticed that the millet was really grainy. It was more like a fine sand than flour. The next loaf I used buckwheat and teff and the texture is much better although not as good as I get at home. So in answer to your question, feel your flour. Choose the most powdery ones. I’ve now decided after this loaf that I don’t really like the flavor of buckwheat. It’s too overpowering. 3) Yes! I have a pizza recipe that I need to post. It is soooo much better than anything I have had in a restaurant (I’ve never tried Udi’s). Until then if you want to use this recipe you can go to the original recipe and look in the comments. Someone there posted what they do with the recipe to make pizza crust. I’ve never tried it because I have another recipe I use and love. I’ll post that pizza crust recipe (which is yeast free so it is really quick) when I get home in July. Hey Kim–I’m hoping you can post your pizza crust rec ipe soon. I’ve been buying Udi’s locally, but would love to make my own. Thanks for all you do! Sure, I will do that one next. And I’ll try to hurry about it. Sorry, I know I told you I would get at it long ago. Busy summer!! I have to tell you, I was horrified that my own bread recipe failed me so badly. It was hideous. Any ideas on tweaking it? I made it today with the use of a stand mixer instead of a bread maker. I made 2 smaller loaves out of it instead of one. They are very pretty and rose perfectly. They are moist and light with rounded tops. I wonder if adding more starch and less whole grain and then doing it in the oven with more yeast and two pans would help up there. Any thoughts anyone? I feel so bad that there is such a tremendous difference in outcome when made up there. I can’t even play with the recipe while in AZ. This does make me want to make some more today and try it with those changes and see how it turns out. Hi Kim! I was googling Udi’s and stumbled across your blog post about your award-winning bread, and then clicked over to your simplified recipe! I am SO excited to try it out! I am pregnant with our 3rd and still in the nauseated stage (even though I am 19 weeks–ugh!) but if I can make myself brave the kitchen tomorrow, this is what I am doing! Thank you SO much for your blog and your recipe! We’ve been buying Udi’s (so pricey, but I have not been baking, I’ve been barfling) but other than that we’ve been making Pamela’s bread mix, which makes a nice, soft, versatile bread, but tastes too sweet to me. I am really looking forward to a “real” recipe that I can play with! I’m glad you found the recipe. You made me giggle ~ not baking – barfing. I remember that all too well! I hope the recipe works out well for you. When I visited family this summer I was buying Udi’s bread. While it is, by far, the best bread you can buy, it is crazy expensive. I am also glad to hear you want to play with it. As I have said to previous commenters, your location (elevation, humidity, altitude, barometric pressure, alignment of your oven to Venus…. I don’t know) and the texture of your flours seem to make a big difference. If it doesn’t turn out soft, foldable, moist and light feel free to drop me a line and we can talk about possible fixes. I’d love to hear how it works out for you. Hope you feel less barfy soon!! Hello! Love the site – thanks for the great recipes! I made both the simplified and original bread recipes this weekend. They both tasted really good, but neither of them rose very much and the simplified recipe seemed really dense. The original recipe also seemed to get mushy after a day or two. I saw your comment above about the texture of the grains and thought maybe that was my problem? I used teff, quinoa, rice, tapioca and potato flours from Bob’s Red Mill and all are very fine – like sand. Should I look for flours that are less fine? Any suggestions on brands? Thanks!! Hmmm, that’s really interesting. I have never had a problem with it getting mushy except for one time that it didn’t bake long enough. Is it possible that it needed to bake for a few minutes longer? It could be that you need a bit more yeast for the rise. I have been using 1 T with each batch. Try a little more next time. Did you use a rise time of 50 – 60 minutes? Bread maker or on the counter? If on the counter, was the room warm enough? I have also been making the simplified version done in my stand mixer and baked in 2 small loaf pans. I get a better rise and it doesn’t fall in the middle at all. I have never used Bob’s Red Mill flours with the exception of the teff. I buy it from the supplier that supplies BRM. The flours I use are finer than sand. They are very smooth and powdery. I can’t really suggest sources since we grind our own millet, quinoa, buckwheat, amaranth etc. I get our tapioca flour, potato starch and white rice flours from an asian store here in Phoenix area. All three of those are as powdery as corn starch. As for the density in the simplified version, if the addition of extra yeast doesn’t help I would try cutting back on maybe a 1/4 up of one of the flours and subbing a starch (tapioca flour, potato, corn) and see if that helps be a little more fluffy. I really hope that helps. Good luck!! Cool – thank you for the tips! I used a bread machine to make both, but it’s kind of old and can’t be programmed. I just used the “Basic” setting which takes about 3 hours start to finish. Our KitchenAid died last week and we haven’t gotten a replacement in yet, but once we do I’ll try the handmade way as well and see how it goes! I had great luck with your Teff “Corn”bread (I recently was told to cut out corn and I’ve been missing corn bread – so I’m so glad to have that recipe in my book!) so I’m sure practice will make perfect on these breads as well. I think with the bread getting mushy…I may have cut it when too hot and then I put it in the fridge, so I think that may have hurt the texture. It was amazing hot from the bread maker! And it still tastes great if I toast it (no GF bread goes to waste in our house! 🙂 ) Thanks! Thanks for sharing this (and the original) recipe! I was planning to make the simplified version and noticed that the potato starch measurement was double the amount in the original recipe. Can you please tell me if this was intentional? Thanks! Yes, that is intentional. In the original recipe there is a 1/2 cup of two different kinds of starches. The simplified version is just once cup of one kind. Lately I have been using one cup of tapioca flour. I don’t think it makes much of a difference to mix and match the starches – or the flours for that matter. Thanks for stopping by. I hope you like it as well as we do! Thanks for your reply! I’m new to GF baking and didn’t notice the two starches. I’m looking forward to trying out your recipe soon! That’s great! Please let me know how it turns out for you. Thanks so much for sharing your bread recipe. I am on a grain-free diet and tried it with quinoa and buckwheat flours, potato and arrowroot starch, and substituted guar gum for the xantham gum. I was very impressed by how well it turned out. My airholes were a little big though and made it difficult to cut a slice without it breaking. I used the basic cycle on an older breadmachine that isn’t programmable. Also it rose so high that it spilled over. I didn’t ever know how to make regular bread, so grain-free bread is a totally new adventure. Despite my difficulties, I look forward to trying it again! Thank you so much!! What an awesome idea to use that combination to make it grain free. I have been largely grain free for the last couple of months but I can’t say I ever thought about making my bread with those flours. Thank you thank you thank you for commenting. I have been going without bread and the kids have still been eating it. This will solve both of those problems. I just have to go get some guar gum. I will make it like this tomorrow. I swear, by blogging I learn so much!! For the rise, it’s funny, some people have trouble with it not rising enough. Where are you located? I am wondering if the humidity and or elevation have a huge impact on it. Maybe try cutting back on the yeast a bit. Thanks again for letting me know. I think I should make stuffing fom turkey from this. It’s just our immediate family this year for thanksgiving so it’s a perfect time to try out new things!! I’m so glad I could suggest something to help you! Especially since you have returned bread to my diet! I live near the Texas Gulf coast. I looked it up on googleearth and we’re at about 35 feet above sea level here. So weird that you are having issues with over rising. I’m at 2400 feet and in the desert yet when I go back to Alberta which is about the same elevation but more humid I get dense, dry, brittle bricks. I need to go back to visit family so I can play with the recipe so I can get it figured out. There are a number of items left out of the simplified version…does it taste as good as the original and rise as well? Yes it does. To be honest, the simplified version is the only one I use now. I make it so often that I needed to steamline the process. Hi Kim – It’s been on my agenda to bake this bread for a couple of weeks now…and today, I was finally able to get it done. It’s in the oven right now. After I put it in to oven, I read the posts about it falling, and being better to divide into 2 loaves. Hmmm, hopefully, it turns out. It smells like BREAD! I used 1 Cup millet, 1/2 Cup Teff, and 1/2 Cup Brown Rice Flour, along w/ 1 cup potato starch and two Tbls. flaxseed meal. I also used 1/4 cup honey. Can’t wait to try it with dinner tonight! I just love that smell. I can’t wait to hear how it turns out. My daughter found your website while searching Udi bread. We had been on a marathon GF bread baking mission as she has just found out about her gluten intolerance. It rose very well but collapsed big time when I took it out of the oven (I have an old bread machine but no GF setting and has seen so much flour I think it would contaminate. ) My daughter thought we had let it raise to long (does that happen?) I think it should have baked longer. She thought it was done, I wanted to bake it more. I think I’ll try doing smaller loaves and bake it until I think it’s done. I’ll try the simplified version next time. I think we used teff, brown rice, buckwheat and millet in that loaf. I would agree with you. It will fall terribly if it is undercooked. Yes, I think I too have heard of over-rising but that’s pretty hard to do with gf bread being that it is so heavy. There was one commenter though who did have that problem so it’s certainly possible. I’d first try baking it more before changing anything else. Good luck! Sorry it’s taken so long to get back here! Well, my bread looked and smelled beautiful…but I was completely off on the baking time – although it looked beautiful on the outside, it was still gummy and unbaked in the middle, so of course it fell. Need to try again and bake longer. I too will try smaller loaves. I have my stoneware mini loaf stone, and I can make 4 small loaves with that. I think that’s what I’ll try! That is so annoying when you make the extra effort to make something from scratch and it completely bombs. I hope you have better luck next time! It must have killed you to have that awesome smell in the house and then have the bread not even be edible. I was thinking next time I would just rub some in and scoop it into my hands and make a ball. Even my son who won’t admit he probably is intolerant liked them so YEAH, he’s getting it. He has extreme dry eyes and skin that nothing helps and lots of sinus trouble they can’t figure out why. Now that my daughter is getting better with stomach and rash problems he is thinking he might cut back. Good news: An agronomist I work with just sent me a PDF on some news about corn. By removing some fat from the protein in it, they were able to get the dough to stick together and have an elastic quality like wheat flour. In tests it made rolls that are really close to wheat, light and fluffy. Corn and Sorghum are close so both should be able to be used. Perhaps soon it can be enjoyed by all who don’t have the corn allergy too. I too heard about this. That is great news. Wouldn’t it be great to be able to buy a decent loaf of gf bread? I love my bread and I like knowing what is in it but in a pinch it would be nice to have the option to buy a good tasting loaf. Would I buy it regularly? Or would I use it in my baking routinely? Probably not. Corn is in absolutely EVERYTHING. I personally don’t think it has much to offer nutritionally so we would not eat more of it. But whoever is first to the market with this corn flour is going to make millions! Thx for the info, Betty. I so hope that it works out for you. I don’t even use my bread maker for it anymore so you really don’t need it. I bake it in 2 small loaf pans and freeze one for later. Be prepared to play with the recipe a bit. It seems that the fine-ness of the flour you use really effects the end product as well as the elevation. All I am saying is that if it isn’t perfect the first time around let me know and maybe we can trouble shoot and figure it out. I tried out your full version recipe today, and literally was on seventh cloud on tasting it. Thank you so much , you are a saviour. My 7 year old daughter has CD, though me and my husband don’t. And she does not even remember how a wheat bread tastes( she was just 4) when she got diagnosed. But she is very happy to have bread butter and jam, the simplest form of eating bread, as she would always yearn for it. Though I tweaked a little. I live in north India, and at this moment the day temp is 50F. So I proofed the yeast with milk(100F temperature) and half tsp sugar for 10 min. Used 1 extra egg as egg size was small, substituted tapioca with arrowroot starch as I couldn’t find tapioca, used half cup sorghum flour and 1.5cups flour blend (I use it to make flat bread or chapatis) regularly. Since temperature was low here, I let it rise for 60min in preheated oven (200F), then baked for 10min and then 35 min covered with foil . Also I used Aluminium container lined with parchment. Can’t wait for my husband to come home and give his comments. But still the upper crust is hard, although I am not complaining as texture and taste is so good. Can you suggest something for it? Also pls advice the dimensions of the glass conatiner that you use. My dough never rose above the top of mine…..Thanks a ton again…you are my hero…. I am so glad it worked for you, even on the first try! I use nonstick aluminum, which isn’t really the best but until I replace that’s what I am using. I believe the dimensions are 8×4. This recipe makes 2 of those sized loaves. It has been really cold here lately too so when I made bread a couple of days ago set my oven to 200 degrees. I used my stand mixer, combined the yeast with the liquids which are warmed and let that sit there as I got everything else together – which is maybe 3 minutes. I then added the dry and mixed for about 5 minutes. Divided the batter/dough between the two pans. I turned the oven off and opened the door for a minute and then let the bread rise in the ovenwhich was turned off with the door closed, for 40 minutes. I do not cover the rising dough. It almost rose too much meaning that it fell a bit flat over the top as it was baking. If it is warm enough in the house I let it rise on the counter top until it is just higher than the edges. The amount of time I let it rise varies according to how warm the house is. I also do not cover it while it is baking. I do not have a hard crust. Maybe it is from the covering??? I don’t really know. I have not heard that complaint before. I also don’t bother with the parchment paper. Was that time consuming? What did your husband think of it? well kim,…I finally got my sourdough bread to work in western canada. The secret was in the starter…..as i had disasters with yeast. So I think to get your bread to work for me I will have to make a brown rice starter……i did try another GF bread on another site using all purpose starter and had great results…..doing the over night fermentation. Now that sounds awesome! Care to share the recipe? Maybe you could do a guest post??!! I want to try this! Hi Kim, my husband just loved it. And the bread’s already gone in 1day although the last piece left has become dry (but it is not crumbling). Would you suggest adding more liquid (milk or oil)? I am going to try again today. I had made one loaf with half the written contents in regular al pan 9x4x2.5 and dough was filled just 1inch and rose to 2inches. As for parchment paper, I had read somewhere that it is difficult to take out bread once done. But otherwise all sides browned perfectly. Today I will try in10x5x3.5 container of al and full recipe quantity, w/o covering and patting the top with little oil as you suggested in one of your blog. Will get back on the result in the evening. That is so great to hear. Successful gf bread is a beautiful thing! You could try to add more oil. Let me know how that turns out. It is a normal thing for gf items especially bread to dry out pretty quickly. If you put it in the fridge it dries out even faster. I think most gf baked items are great the first day and then change pretty quickly. Please do let me know how it turns out today. Has anyone ever tried doing this in a dutch oven like a no-knead recipe? I don’t think you could preheat the dutch oven and put the bread in as I’m sure it would fall but perhaps you could let it raise in there, bake it at a high temp for say 15 min then drop the temp and finish baking? I have never heard of this. It sounds really interesting. I could never make wheat bread. It always turned out like a brick so I know nothing about different techniques. What is the purpose of doing it this way? I need to make bread in the next couple of days, maybe I will try it. I’m not sure the purpose, I guess from what I’ve read it’s crusty and nice…but I don’t know. I know the heat would be more even. If you do it, please post how it turned out and how you did it. I got a new Enameled cast dutch oven and was looking at it. I could do the wheat recipe but it this works and I like my oven, I might get one for my DD who’s Gluten intolerant. …although I think my son and husband are to but don’t want to admit it. I think my son is going to be on the diet whether he wants to or not. Since I found your website and and have been practicing making stuff for DD and he’s my taste tester. He pretty much realized he won’t be deprived. I do it all the time with my breads, …..I just use parchment paper during the rising portion, then I just life it out and place it on the hot dutch(i place a pyrex dish in side the dutch oven so i get a loaf shape) , very safe! then cover and bake according to your recipe instructions. So what is the purpose in doing it this way? What temps and times do you use? So; let it rise in a bowl lined with parchment. Preheat a dutch oven with a bread pan inside of it. When bread is done rising turn it out into the hot loaf pan? Bake with lid on? Is this right? I am intrigued. DUH, Parchment paper. But please share the temps and time you time you do Jo-Anne. It is too complicated to go through here, just follow the sourdough recipe for “NK sourdough” that you are using. It will tell you how to heat up the dutch oven, and what temperatures. I am just helping you if you do not have a covered sassafras clay baker that is the shape of a loaf. I use a large covered dutch oven and place a glass pyrex dish inside to heat up. I line my bread in another glass pyrex dish to rise , with parchment paper. that way I can easily hold the paper to transfer to the very very hot covered dutch oven. I was so so busy yesterday, that I did not have time to expand, so apologies for my abruptness! I use the Mad Fermentationist sourdough recipes and the Cheeseslave recipe instructions for the starter…..can be googled. Thats’ the only recipes that work for me at high altitude where I reside in Canada. I like this sourdough recipe as it calls for allot less flour which helps to keep the carbs way way down, producing a much lighter bread, compared to other ones I have tried, and believe me I have tried allot! I had to do allot of tweaking for my altitude and zero humidity, whereas most folks who don’t have those issues can follow the recipe straight forward. OMG, I actually had this turn out fantastic. Here’s what I did. No bread machine. I used warmed milk, melted coconut oil and put all the wet stuff in the bowl of my mixer. Then I added the flax while I mixed up the rest. I used 1/2 cup sorghum and 1/2 cup millet and 1 cup teff, followed the rest of the recipe. I poured it into a greased pan and let it raise. Now I did 40 min and that was WAY to long, it was overflowing so I fully expected it to fall as dough was falling off the edge of the bread. I threw that on a small stone and put it all in the 350 degree oven for 30 min. Then for the last 5 min I turned the oven off and left it in. When I took it out, I removed it from the pan and let it cool 5 min on one side and then turned over to the other side. I think that prevented it from falling. We were finally able to have a bread that was like BREAD. You have described my technique nearly exactly. I even turn it on it’s side too for a bit while cooling. I don’t use a stone and don’t leave it in the oven for the extra couple minutes. I really think though that the key to not having it fall is letting it bake a couple minutes longer. It has made all the difference for my loaves. I am so glad it worked out for you. Yay! Real bread!! Made another loaf the next day, I used 1 cup millet, 1/2 cup teff and 1/2 cup sorghum. It tasted like honey wheat. My GF daughter was thrilled! She says we should put some GF oatmeal on the top so it looks like it. LOL I think I’m finally ‘getting’ this GF baking stuff. It’s been a challenge. An expensive one! We made some GF graham crackers using a recipe from GF Living magazine she bought. She said if there was pill, she’d take it though. I’ve never made graham crackers. Were they good? Sometimes I use flax and seseame seeds on top to make it look pretty. Sometimes I put whole seeds in the bread for the crunch too. It’s great to hear that your daughter approved. What a relief to have bread again, hey? The graham crackers were pretty good. The first batch I forgot to put in the flax meal right away so DD wanted to try half with and half without. Don’t omit, much better with. Then it said to divide dough in half to roll out, they are too thick, we had to divide in 1/4 to roll thin enough. They were very good. Not a total clone of store bought but a very good substitute. The thick ones we frosted with chocolate so they are more like a cookie…an English biscuit…she studied in Scotland so thought these were good. Thanks for the links. I’ll check into them. I’ve never tried either. I cannot believe how wonderful this bread is. I bake for myself and a friend and have tried many recipes. This one is the best yet. Thank you so much. Thanks so much for taking the time to leave a comment. I am really happy that you enjoyed it. This recipe sounds great. Picked up my supplies and I will be baking tomorrow… Does anyone know the best way to store this bread? I am going to be traveling and would like to take some with me. Has anyone tried freezing it, then thawing as needed? Thanks. When I make it I make 2 mini loaves from this recipe. I leave one out on the counter and put one in the freezer. I know that some people slice it and wrap each piece individually and freeze that way. Like any gluten free baking item it is best in the first 2 days. After that it’s drier but by that I mean dry like the store bought gf bread. Freezing it too does make the thawed bread slightly drier than fresh out of the oven but honestly my family has never complained about it, ever. I’d love to hear how it works out for you. I’m currently 6 months pregnant, with a 2 year old son. Within the past month, we’ve closed on our first house, moved AND been told to go GF/CF! So it’s been a bit of a transition. Your (original, not simplified) bread recipe was the first bread I’ve tried that looked (and tasted) like bread! No more Bob’s mixes for me! I even did the Great Gluten Free Bread Experiment: double batch-one loaf in the oven, one in the bread machine(panasonic sd-yd250-no GF cycle). Both came out great-although my oven one did fall, and was a bit gummy. I think I’ll split into 2 pans next time. Do you cool it in the pan a bit to let the structure set, or take it right out? (I was so excited I took it right out, although I did wait til it was cool to try it) I was pleasantly surprised that the bread machine came out as well as it did. This is the first bread we could slice and eat untoasted!! Like real bread!! I’m thinking of trying another batch and forming ‘buns’ for dogs/burgers for the Fourth. Do you think that would work, or do you have another recipe you could point me towards for that? Wow! Now that is a whole lot of change and stress. I’m am so happy to hear that the bread, mostly, worked out for you. The next time you try it in the oven bake it for a couple minutes longer. The crust will be quite dark. Let it cool for 15-20 minutes in the pan before removing it. Then it shloud hold its shape. Cut into it when if it quite cool, other wise it will become more compact. However it tastes pretty awesome warm so its a trade off. 🙂 I have made buns out of this recipe. They were great. I lined a cookie sheet with parchement paper and had a little bowl of coconut oil nearby. I coated my hands in oil and then formed small balls. I made dinner roll sized balls and baked them for maybe 15 minutes. I can’t remember exactly. I was winging it and just watched for them to be the right color. Its a messy process but we all loved them. I bet these would be great hamburger buns. Good luck to you. Let me know how they work out for you and if you do anything different. Happy Fourth of July! For the coconut oil is that 1/4 c solid and then melt or 1/4 liquid coconut oil? Sorry, I have only seen the solid version in the store. Coconut oil is solid when below 76 degrees and liquid above that. Your coconut oil isn’t any different than mine. In the winter time I do melt it to get it liquid again. Kim – thanks for the quick reply! So did you use 1/4 solid? In your hand mix instructions it looked like you mixed all your liquids in mixer (water,oil, honey,eggs), then mixed in dry (salt, flours, starch, xanthum) and last mixed in ground flax and yeast. When all mixed then put in your glassware. Looks like you did not proof your yeast but added it at the very end. I have read that the salt activates the yeast? Can you tell I am not a bread maker 🙂 I have also read that the longer you mix, the more air that gets into the bread? Sorry for so many questions! Like many others, I have had many failures. The weather is cool enough to use the oven so I am anxious to bake a loaf. From reading all above, it looks like Betty had great success! Thanks for your time, your recipes and thanks to all the comments on their success/failures!! I use 1/4 cup of melted coconut oil. I use expeller pressed coconut oil so that it doesn’t have the flavor of coconut. As for the yeast part of your question…here is what I am doing currently. In a mixing bowl add the eggs, warm water, oil, honey and yeast. Mix that up a bit then add everything on top. As you are adding the yeast starts to work. You don’t need to proof your yeast. I never did before. I started doing this because I was starting to wonder when my yeast was going to stop working because I bought it well over a year ago. So I started this just to make sure it was still okay now it is habit to do it this way. Don’t over mix gluten free breads. Or that’s what I keep reading. I tend to mix even less now than what I have in these instructions. After mixing, I grease my 2 mini pans and put the bread in the oven which I had pre-warmed to 200 and then turned off. I set the timer for 20 minutes. (The bread is not huge and puffy at this point but will continue to rise as it bakes) When the timer goes off I leave the bread in there and turn the heat on to 350 and set the timer for 37 minutes. When it’s done I let it cool undisturbed in the pans and let the bread sweat a bit so that comes out a bit easier. It does fall a tiny bit but does not cave. It still looks just like wheat bread does. No lumpy caved tops and is soft, tender, moist and pliable. Hope this helps! Good luck. Let me know how it turns out for you. Thanks for the detailed reply! I did give it a try before your reply and did not turn out too bad. I made it on Sunday and it is dry and crumbly today. I am going to give it another try. Thanks!!! This is the BEST gluten free bread recipe I have ever tried! I used to eat Udi’s but when we moved and the price was over $5 a small loaf, I knew I had to try something else. Thanks so much for making this public–though I would gladly pay you for the recipe : ) My kids go to a school that has sandwiches brought in every day for lunches. Now they feel like one of the crowd when they pull out their sandwiches and they look like everyone else’s. And the bread does not come home. I usually make two loaves every other day–one for everyone to eat hot and fresh and the other for lunches. Breadmaker makes it foolproof. Thanks again so much! That is so awesome. I am so glad you found my recipe and that it works for you. To be able to give your kids the same lunch that everyone else has is really priceless but even better that you don’t have to pay an arm and a leg for so so store bought bread. I really appreciate you taking the time to leave me some feedback on it. Thank you. You made my day. 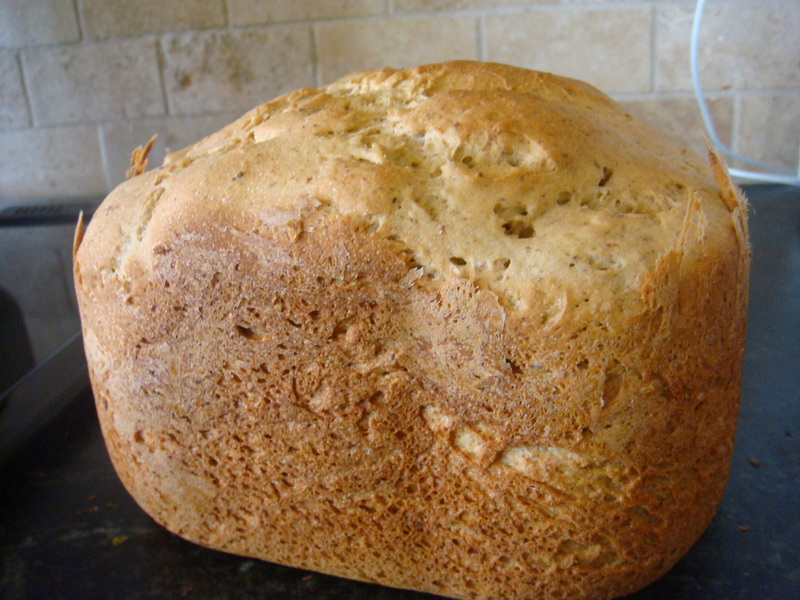 I made your simplified bread yesterday, using the NON-bread machine instructions…..and it turned out fabulous!!! I made one loaf in a Pampered Chef stoneware loaf pan, and it took all my will to let it cool before slicing. As others have said, I love that it is soft, and since I’m avoiding dairy I’m so glad your recipe doesn’t include it. I’d love to try it using my supply of Better Batter GF flour, and am thinking I just need to add some additional xanthan gum—any ideas on how much for your basic recipe? THANK YOU so much for all your efforts! I’m so glad it turned out. I never use the bread machine anymore. As a matter of fact I gave my machine away. I think it works out better in the oven. I’ve never used a gf flour mix. So I’m no help at all in guiding you in proportions. Sorry. I’d love to hear how it turns out though if you do try it and love to hear if you think it is cost effective. I made another loaf subbing Better Batter for all the flours, and the weirdest thing happened—the bread rose very high, creating a “muffin hat” like sometimes happens on muffins, and then of course it shrunk down. Wish I could send you pictures I took of it; don’t know why that happened or how to prevent it. Any ideas? I’ve found when that happens to me, there is too much liquid in the batter. I make this batter to the consistency of thick cake batter. I have to use less liquid with quinoa so I add everything first and reserve the 1/3 cup water and add in a little at a time until its the right consistency. Hope this helps, I love this recipe! Your recipe is fabulous! I love that you can mix and match flours and still come up with a positive result every time. I made a loaf with buckwheat, quinoa, and added chia seeds into the mix. I also made a flat bread with sorghum and millet, and topped it with sesame seeds. Both were great. The crust is tender, and the inside is moist and not crumbly. This bread freezes well and be stored in a ziploc on the counter for a few days without going stale. I can’t wait to try out teff in the mix soon. However, I will admit I am having some difficulty in getting my loaf it to rise properly. My first loaf cooked for 45 minutes after an hour of proofing and it was a little gummy. I tried again and I let my loaf rise for almost 2 hours and turned up the heat to 375 for 30 minutes. While it did cook through, it did not get near the height of yours pictured on your blog. I live in San Francisco. I will be experimenting with dividing the dough into two small loaves and altering the starch content as mentioned in your earlier posts. I also used an egg replacer, and water instead of milk. Could that be affecting the rise?? Oh well, regardless, nothing has gone to waste. I am a first time mom of a post reflux baby who finally found relief after dairy, gluten, egg, soy, and corn was removed from her diet. My baby has been reluctant to eat since the day she was born. While she is eating more these days (relatively speaking), the only food she gets excited about is bread. I can’t tell you how much time, money, and tears I’ve wasted in making and buying really bad bread. I am relieved that I can now give her something she easily accepts and enjoys, and be confident that she is getting some of her nutritional needs met. Thank you! I’m so sorry for not replying sooner. Darn life sometimes gets in the way. When you say you proofed it for 45 minutes does that mean that you let it rise for 45 minutes and then again for 2 hours? Something is definitely off. I let mine rise for 20-25 minutes. I don’t know why this happens with some people. I don’t expect that you have read all the previous comments but I’ve tried to make my bread when I visit my family in Alberta. It has always turned out like a brick. It’s very dense and heavy albeit tasty. The only thing I can guess is that it is the flours. I noticed that the flours I use there are ground courser. That said I never had the time to really play with it to figure it out. So like you said maybe subbing some of the flours with starch might help to make it lighter. Or try different flours…. I do think the egg replacer might be an issue. Just try water. That’s all I use now. What is the doughs consistency like? It should be much like that of muffin batter right before you let it rise. I wonder if you need more liquid…. I’m sorry I can’t give you something more concrete. I’m so happy to hear that you figured out your daughters reflux issues. Did you have the help of a doctor to figure that out or did you do that on your own? I personally think that food intolerances are a huge problem that most people and most doctors never consider. How is she doing now? Again, I am so sorry for the huge delay in responding to your comment. No worries! I was able to get my bread to rise a bit more, but it still takes 45 minutes. Then when I bake it, it tends to sink. I think I may need to give it less time to rise like you suggested and play around with the flour combinations. The dough is thicker than muffin batter, so I will gradually add more water and see what happens. Using a smaller loaf pan seems to help too. Regardless, it’s still really good bread. As far as managing reflux, the doctors that I’ve worked with were not helpful. They basically gave drugs and when it didn’t work, then we got different drugs that didn’t work either. I did a lot of reading on food intolerances, and came up with my own intervention. She is doing well now, but I’m not exactly sure if she has a gluten sensitivity or not. It was the last potential food irritant I took her off, but I did it without having the blood work done first. I didn’t know any better then. Now that its been out of her system for 7 months, I’m hesitant to give it to her to avoid any potential of having a GERD relapse. All the other foods I’ve either intentionally tried or accidently given it to her and saw symptoms. When she can talk well, I would like to work with a professional and start reintroducing foods again to see if it still has an effect on her. She is continues to be inconsistent with eating. We just found out she has a small cleft on her soft palate. We have an evaluation to determine if this might be inhibiting her ability to swallow, or if she is just a picky toddler who prefers to drink than eat. My husband is currently getting checked for food intolerances by a holistic health center. He has had GERD and needs to take medicine daily for it. He is also constantly getting sick. I’m hoping they can use his findings to help our daughter. It’s a lot of work, but worth it for a healthy family. I’m just grateful that my baby is happy, and I feel very lucky that she has never had an issue with her growth or development. Thank you for getting back to me! Your recipes are great. I made your moroccan chicken last week and it was delicious. It’s hard to come up with dinner ideas, much less finding support for food intolerances. For the bread sinking after baking try baking it for 2-3 minutes more. I’ve found that works well. It still falls a bit but uniformly and that is a good thing. I think that if it didn’t fall at all that it would become crumbly by the next day. Sometimes it seems as though doctors today do nothing but prescribe drugs. There seems to be little interest in finding the actual cause of the symptoms and instead just treat the symptoms with drugs. I’m so glad to hear that she is doing better. Cheers to you for figuring it out on your own. For your husbands GERD-have you read anything from Chris Kresser? He is a naturopath in San Francisco and runs a huge blog. He has a series about GERD. Here is the link for part one of five parts I think. http://chriskresser.com/what-everybody-ought-to-know-but-doesnt-about-heartburn-gerd. It’s great information and it is all diet related. Thanks for reminding me about the Moroccan Chicken. I haven’t made that in a long time. Sorta forgot about it. Ironically that is why I started this blog-so that I wouldn’t forget about recipes we like. I don’t eat grains anymore and feel so much better for it but I could serve that with cauliflower rice… Mmmmmm. Thank you for the link about GERD. Very interesting! I found if you put the loaf on it’s side when you take it out it doesn’t fall. Works for me anyway and worth a try. I did respond to you this morning on facebook. Wasn’t ignoring you. 🙂 I didn’t know there were two kinds of sorghum flour. So I guess I was using the regular kind. Does the sweet one look any different? Now I am curious. Just to say that I found you on Google at the top of the list of “gluten-free” whole foods. Thanks for your great recipe! That’s is really cool. Never would have guessed that. Thanks! Just stumbled upon your blog. Interesting discussions too. I have been experimenting with gf baking for a few years now and by far, yeasted breads are a bear! Sometimes they work, sometimes not. I have found that weighing everything really helps. I get the most consistent results this way. It seems to matter how much each flour and even liquids weigh. The flours matter the most. I do agree that the grind may also matter. I have been experimenting with buckwheat flour subbing for xanthan gum. I grind it myself from the raw groats. I found a reference here: http://www.eatingrules.com/2011/10/what-are-gums/ by the Gluten-Free Doctor. I soak the buckwheat flour in the liquids just like activating ground flax. So far my quick breads are turning out better than with xanthan. I am about to start experimenting with subbing it in for 30-60g of the flour mix in a yeasted bread recipe and soaking it like I do with quick breads. I don’t like a lot of eggs in it either so it is a challenge since egg does helps with the rise. For bread that over rises, it is usually due to too much liquid vs. whole flours. I make little foil tents over my bread and toss in ice cubes on a hot pan in the bottom to create a moist environment in the oven. This way the bread doesn’t get too brown on top with the much longer baking time for gf bread. I usually bake mine about 70-80 minutes. If it still is crackling (take it out carefully in an oven mitt and listen) I put it back for another 10 minutes. I also cool it on it’s side flipping after a few minutes to the other side. I’m going to try your recipe because it is much more whole grain than mine has been. Thanks so much and happy baking! Wow! You have made a science out of this. I’m impressed and feeling a little inadequate because I just do it by feel. Good tip about the weighing of the flours. Thanks!! You just made my day! I’m so glad it worked out for you. That’s always my test-is it edible to those that don’t have to eat gf? If it is then that’s a success. Thanks for taking the time to leave a comment. Your “By the time the yeast actually comes in contact with the liquids everything is the right temperature.” was a shock! With all the years I’ve made breads I never figured that out. Oh the shame. Many thanks this will save time. Will use tonight with your bread. Don gets surprised every time he see the elephant sitting in the corner. Hi Kim, I haven’t tried your recipe yet but defintely this weekend :), what do you suggest subbing for the honey? DH and I don’t do sugar, would more water or non-dairy milk work? You can’t really omit the sugar. The sugar is what the yeast feeds on which is what gives you the lift. Without it you will bake a brick. That said, I do mine with water so it’s possible I guess that using milk may give some lift. I’m pretty anti sugar too but a couple tablespoons in a whole loaf is pretty negligible. If you do try it without I’d love to hear how it works out for you. Okay, so I tried it today in the breadmaker on sandwich loaf (takes about 3 hours – but supposed to produce lighter bread :)). I omitted the sugar and I used 1/8 c. water and 1/8 c. coconut milk. It rose but not quite what I was looking for. Hubby loved the taste, was even okay with the texture and density. Next time I’m going to increase the liquids a little with almond milk. Oh yeah I also cut out one egg and added 2 tsp. ground chia seed which I will cut to 1 tsp. If I try with sugar it will be coconut as I don’t think Stevia would do the trick. Sorry that should say coconut oil not milk. It is a little nuttier, I get the unsweetened almond milk. Gosh I would love to be able to make my own almond milk, but sadly do not have the time. I’ll let you know how my next loaf or 2 turn out with my alterations. Can I make it without a bread maker? Of course. I now only do it in the oven. I gave away my bread maker. I make it in two small loaf pans. Love this bread!! I did a search for Udi’s bread recipe, and found yours! We made 4 loaves in 2 days! We added raisins and cinnamon, and my three boys love it! We like the original version a bit better, it seems a little denser and I am wondering if that is because the original recipe calls for 3t of xanthan and the simplified calls for 1 slightly heaping t of xanthan. Why the difference in the two recipes? Thanks again, and really big thanks for not closing your blog! I’m so happy to hear that you had success with it. Your variations sound great. With regard to the xanthan gum, I honestly don’t measure very accurately. I think I’ve been using about 2 tsp. It works. I used this recipe today for my very first homemade bread EVER! It turned out PERFECT!!!! Its so delicious. Its way better than the store bought. I altered a few things. I used sorghum flour but for the other flour I used an all purpose GF flour mix. I also used a hand mixer with dough hooks and baked in the oven. Thanks so much for this recipe! Its going in my book for sure! I’m so happy to hear it worked out for you. I do mine in the oven now too. I think it makes a better looking loaf. Kim, what is the best way to store this bread? Does it last long without growing mold? I have mine cut and in a plastic baggy but I dont really know how make it last as long as possible. This was my first bread loaf i’ve ever made so i’m new to the scene, lol. I keep it on the counter and slice as needed. It is good for about three days. I’ve heard of people slicing it and freezing it like that. If you are the only one eating it that might be an option but I personally think it comes out of the freezer more crumbly. Get the whole family on board and just make a loaf every two or three days. 🙂 Then it will always be fresh and yummy. Hi Kim, my sister is gf and I’ve been on a mission to make the perfect bread for her. After coming up short on many, many attempts I was surfing the net and found your site. I plan on making the Simplified version of your award winning recipe. I don’t have a bread machine. I found your edited directions under the Original recipe for making the bread without a bread maker. Do I use those same edited directions for the Simplified recipe? Just checking before I put in the time! Thanks!! Yup you sure do. That’s how I do it. Good luck. Hope she loves it. Let me know how it turns out for you. Wow, you are one of the most generous bloggers I have ever read. Thank you for your recipe and attention to people’s comments, it’s amazing. I made this bread for the first time tonight. My husband has ulcerative colitis and we have found going gluten free has really helped his symptoms. It’s currently cooling right now and smells amazing. I am in Alberta as well, so I can see I need to tweak how it raises but i am optimistic. Hopefully no more expensive Udi for us! However, thank heavens Udi is around. Sorry for the delay. The holidays have caught up with me. How did it turn out besides dense? I really don’t understand why when I make this in Alberta it always turns out heavy. I wonder if its a coarser grind in the flours as they all feel coarser to the touch. If you are able to tweak it and get it to rise better please let me know how you do it. I’m happy to hear that your husband feels better on a gf diet. Going completely grain free may also be helpful if he has continued issues. Just a thought. 😉 Good luck to you. I too just found your blog as I desperately looked for a bread reciepe that I can do without a bread maker. I tried the longer version last night and will try this one today before I head to work. My son (age 5) also is on the autism spectrum as others have mentioned in thier posts. We just started doing GFCFSF per doctor’s recommendation. I’ve decided to make life easier the whole family will be going GFCFSF, (hubby, baby girl (age 1), son and myself). The Dr. recommended Udi’s which I thought was passable. But now I have made your bread and hands down, SO MUCH TASTIER! I post now because as I was reading the comments of others I noticed that at one time you thought about closing off your blog. I hope you don’t as I can see how much it helped many, like myself make these dietary changes doable for the health of our families. Thank you for your generosity in sharing your recipes! I’m so sorry for the late response. I’m so happy to hear that it has worked out for you so far. We too did the whole diet change together as a family. I thought that was the only way to maintain my sanity. Turns out of the 5 of us 4 of us have gluten issues. 3 have Celiac and I am intolerant. I guess you never really know these things until you eliminate them. Good luck to you. Cutting out soy and dairy I found much harder than gluten. That said. my stint in eliminating corn was horrible. That stuff is in EVERYTHING. I have had so many people like you ask me to not close down my blog so I won’t. I just have to forgive myself for not posting much anymore. How did the simplified version turn out for you? Hi I am recently GF and have been a vegan for over 20 years. My problem is how to bake GF with the challenge of high altitude. We live at 4500 ft. . I’m having problems of the bread baking at the bottom inch or so. I baked the bread for 1 hr. instead of the 30min. The bread was still wet and dense . do you have any help? So can I assume you are using an egg replacer in this recipe? I have never used one. Well, I did try it with flax goo once and it turned out tasty but very dense, heavy and sticky. It sounds like you are having the same issue. I wish I could give you some concrete advise but I would just be guessing as I don’t have any experience with it. Some ideas tho….try cutting back on the water and oil. How is it rising before baking it. Does it get much lift? Yikes, Glad to hear your are ok. I don’t think that should be a problem at all. Brown sugar and coconut sugar are also nice. I am at high altitude also and it is frustrating, especially with GF flours coupled with Low carb flours!!! Increasing the water/liquids by adding chia gel to that extra water, which helps with moisture. Covering bread in large plastic bag while it rises and securing with a clip as high altitudes can be zero humidity. Increasing the with chia gel. Adding 2tbls egg white powder per loaf. Covering the bread with a very large plastic bag and securing with a clip to keep the moisture in. Baking in a preheated clay baker….which means you have to let the bread rise in parchment so you can grab this to plop into hot baker letting it cook in the parchment. I never second rise only “one” rise. Hi Kim, thanks for your recipe. Can I sub arrowroot starch in place of the potato starch? I don’t tolerate potatoes or cornstarch! Really? Hmmm never had that problem. Try baking it in two loaves instead of one. Just guessing. Try decreasing your cooking time. In the simplified version you indicate using ‘potato starch’. I am under the impression that potato starch is used as a thickener for gravy etc., while potato flour is used for baking, because in this case, it would keep the bread moist? Some folks say they are the same thing…….others say they are very different. Could you comment please? P.S. What size eggs do you use? I use potato starch. I’ve seen potato flour and I remember it being heavier and more dense. I also use large eggs. Hi Kim don’t know if this question has been answered but do you have to use sugar? OH MY!!!! this bread was AWESOME! thank you. I just find out my gluten allergy and was so sad that I could not bake my old bread recipes anymore…I make one fresh loaf every day for my kids and I just did not have one bite of it…I was so miserable…I tried this…the kids loved it, my hubby loved it…I LOVED it! thank you!!!! I made your simplified recipe for the first time and the taste is great. But, it swelled up HUGE in the oven then did not hold it shape when cooling. It is small and sort of smashed up. Why would have it swelled up big? I used millet and sorghum. I live in seattle. Try using half the amount of yeast and keep and eye on it when it’s rising. Only let it double in size. How wet does your batter look? Is it thinner than my pictures in the original recipe? Hi Kim, just tried this recipe and it’s baking at the moment.. I’m a little bummed trying so many different recipes to bad results. Looking through the oven window my version of your bread didn’t rise during baking, it smells great and I can’t wait to try it, but like I said, I’m a little bummed I didn’t get the rise in the oven like your pictures. As a note I didn’t use Xanthan Gum but instead Psyllium Husks ( I just don’t trust the gums). What would be awesome is a video showing your steps in detail as I admit it was a bit confusing switching between the two recipes for directions, it was a bit hard to follow precisely. Ok I have to make this bread rise… it’s amazing! Best flavour I’ve had so far. Ok I used two small loaf aluminum pans (which is probably my first mistake) and I put the remaining batter in a non stick muffin pan, which rose a bit better btw, could this be a real factor? Did you ever get this to work? I can’t imagine how it could without xanthan gum. I once forgot to add it and I ended up with the most disgusting loaf. It was a brick of sawdust that smelled good. I have never heard of using psyllium husks in place of xanthan gum. I can’t imagine that would work. As I have said in another comment, I once forgot to add xanthan gum and I ended up with the worst loaf. It was a brick of yummy smelling sawdust. A close second in bread failures was the time I tried to use guar gum. Epic fail. It rose huge then fell to about an inch high in the middle. It was actually comical. Wow!! I just made this. It looks like whole wheat bread. It tastes like whole wheat bread (as well as I can remember). It FEELS like whole wheat bread. It pulls apart in these webbed layers the way bread should. I am so, so satisfied right now. I’ve tried so many gluten free bread recipes in the last 3 years and been disappointed by them all. This bread is amazing. You are amazing. I used teff flour, millet flour, tapioca flour and cornstarch. I baked them in the oven in two loaf pans. I was too anxious and didn’t let one of the loaves cool completely, so it collapsed, but I inverted the other over a stockpot and I think it will turn out beautifully when it cools. I’m so happy to hear this worked out for you. Thanks for taking the time to give me feedback. Kim love this bread! First successful loaf in bread maker! Do you let it cool totally in the bread machine? I’ve done it both ways. No big difference. Thank you, thank you, thank you!!! I can’t believe I just baked a loaf of gluten free bread AND it tastes great! I am so happy right now. 😊😊. You totally made my day! So great to hear it worked out for you. Thx for letting me know. Hi Kim, can I omit the ground flax seeds in the simplified version? Thanks for the quick response ! Will let you know how the bread turned out. Many many thanks Kim, this is the best gluten free bread that I have baked! God bless you 🙂 it actually tastes like bread. Teff flour is not available here (Pune, India) so I substituted teff flour with ‘varai’ flour(Hindi name), which are seeds of grass which grows amongst rice paddy. Varai is not a grain, it’s eaten here in India during days when people fast and eat only non- grain foods. I used your simplified version, omitted ground flax seeds, only because I didn’t have them, will include them in the next batch. I used half the proportions from your recipe. The loaf did not fall, kept it for 2 minutes longer as you recommended, and then once out of the oven rested it on its side as someone recommended in one of the comments. Once again many thanks, my husband can finally have sandwiches. No gluten free breads are available here in Pune, though we make really good gluten-free flat breads at home, but sandwiches and toast etc were sorely missed. But no more 🙂 thanks to you. I’m so sorry if this has been answered before… there are so many comments to look through! But I just made the simplified version for the first time after using the ‘full’ bread recipe for a few months. The loaf came out like a brick… I never had that issue with the full recipe. Is it likely to be the climate? I’m inland in Australia at a moderate altitude and it was unseasonably wet when I baked it. My son won’t eat it 😦 Any idea what went wrong/how I can adjust? 😕. Geez. I’m sorry. I have no idea why that’s not working. Can this recipe be altered with no flax seeds? I really would like to try it. I have an intolerance to flax seeds. I look forward to trying the recipe. Thanks! Absolutely! Just omit it. No other adjustments needed. I don’t always add it. The best way to store it is in an airtight container on the counter for 2 days. It’s still edible beyond the 2 days but the texture starts to change and resemble store bought GF bread. It can be frozen either whole or sliced and sealed individually but again as with any gf bread the texture will become drier and more crumbly after thawing. So ideally you would make a new loaf every 2-3 days and just keep it on the counter. 😊. Congrats to you on the diagnosis. That will be the start of a whole new healthy life. I’m so happy to hear you found this recipe and that it worked for you. Most of us go through years of eating and making terrible bread before we find one we that we like. I’m new to Gluten Free baking. So far I’ve made 3 different loaves with different recipes – all bad. Too wet and gummy mostly. I made your simplified recipe last night as my 4th attempt. I made it with brown rice flour instead of teff because I couldn’t find teff. It rose beautifully! I was so excited! Then it shriveled like a raisin. Sides sunk in, top deflated a little. I let it cool overnight and cut it this morning to find it fairly wet and gummy. It tastes good, just not PB&J worthy for my newly gluten free 6 year old. I’ll try again tomorrow and this time will reduce the water by 1/3 cup, increase baking time by 15 minutes. I’d like to get it to work in a large sized bread pan so I have a decent size sandwich for my son’s lunch box. Hi there! It sounds as though it wasn’t baked long enough. I’ve found that oven temps vary so widely that you really have to play with this. You can try decreasing the water content too if you think it was really that wet. For the baking, try an extra 15 min. The crust should be a darker brown than that of a wheat bread. Then, like you did the first time, wait until it is totally cool to cut into it. I’ve been hasty before and it was like letting the air out of a balloon. I also sometimes let it rise on its side. Are you doing this in one pan or two? I use 2 small loaf pans now. The bigger the loaf the more likely it is to fall so I just divide the batter into two. Hope that helps. Let me know how it goes for you. Good luck! I apologize if you have answered this question already. Is it possible to substitute the oil in this recipe like the other one? I cannot eat coconut oil. Thank you so much!!! I just plop my whole, uncracked eggs into a bowl of hot water for a few minutes while I’m gathering ingredients. Warms them right up! hi Kim is it ok to sub the honey for sugar (FODMAPs thing) ? Absolutely! Which flours will you use? Hi Kim! Just thought I’d share with you how I re-wrote your recipe for ease of following quickly! 1. Combine first 6 ingredients in bread maker pan. 2. Sift next 7 ingredients and then add it on top of liquid ingredients. 3. Toss in your add ins. 4. Make a little well in the dry ingredients and add the yeast in to the hole. 5. Start the bread maker. Help it out a little…use a soft spatula and scrape down the sides and help everything get all mixed in. Hi, I just wanted to thank you for this recipe! I have been mostly gluten free for nearly a year (I am now trying to cut it out completely as I’ve realised that it doesn’t just disagree with me but makes me actively unwell when I eat it). I have desperately missed wheat bread and was very excited when I found out about this recipe. I’ve made it twice so far, by hand both times. The first time I made it with buckwheat and dark teff. The rise wasn’t brilliant – the bottom half was very dense and brick like and the buckwheat taste was too strong. But though I didn’t like the flavour and was disappointed in the rise, the texture and mouthfeel of the bits that had risen were just right and I wanted to try again. So yesterday I made it with dark teff and toasted quinoa flour; I also activated the yeast separately in the warm water as your way looks very convenient but I don’t think I have the hang of it. This time it rose beautifully and tasted delicious – it reminds me of my favourite wheat bread, which was Cranks Wholemeal. The texture is just lovely. It’s improved overnight, too. I’ve ordered some sorghum flour for my next go and may try and hunt down some ivory teff. My husband thought that the flavour was excellent too. Can’t wait to try it with sorghum! And can’t thank you enough, this is truly brilliant. I’m so happy to hear that it turned out well for you. I appreciate you taking the time to let me know and to write out your directions. When I saw that you first used buckwheat and dark teff I kind of cringed. That would be a very dark heavy loaf. Glad you tried again and got a better result. It truly is trial and error learning. Let me know how your next one turns out too. 😊. Me neither! It’s just foul. It’s so strong. I’ve yet to find a use for it. I will stop commenting at you in a minute but basically I was desperate to make your bread and all I had was rice flour (which like you I don’t like very much), teff, potato starch and buckwheat, which I had tried once and not liked. I may give the rest of the bag away! PS if you’re using quinoa flour, don’t forget to toast it first or it tastes very grassy and earthy. I’ve never heard of toasting it. It does have a grassy flavor. And I don’t like it. How do you toast it? No, it’s not very nice, is it? I spread it in a thin layer on a baking sheet and put it in the oven on 215 F (100 C) for 2.5-3 hours (taste after 2.5 hours and see if it’s still grassy). I have also read that you can do it on 300F for 1 hour but I haven’t tried that. The grassy taste doesn’t completely go but it’s much more subtle. I did the whole bag and then put the rest in the fridge. I discovered this purely because I googled “what does quinoa flour taste like?” before opening the bag rather than being scientific about it and tasting the raw flour myself! But I did recoil when I opened it and the toasting really calms it down. PS finally tried the sorghum and it is fantastic – this really tastes like a wheat loaf! Hi Kim, I have tried several recipes that have all failed miserably, when I tried yours I was absolutely amazed how good it tasted, the only problem is that once I froze it and thawed the bread was extremely crumbly and totally fell apart, I was just wondering if this was something you also experienced and weather you have a remedy for this? Yes unfortunately that’s the norm for gluten free bread and for most GF baked goods. It’s great the first day. Good the second day and then it better be gone. When I do this recipe to make 2 half loaves I freeze one and leave one fresh. I just know that the second loaf is going to be used for toast. Sorry I don’t have a better answer for you. First, congrats! Seconds this looks amazing can’t wait to try it out. Just a few questions, I am actually allergic to potato and hence can’t use potato starch what can I substitute for that? For example can I use xanthan gum, or psyllium husk or more flax instead of that? In addition if I just use to types of flours (buckwheat and amaranth) and follow the recipe (a long with my potato starch substitute) will i hopefully get a successful airy/fluffy loaf? Can’t wait to hear back and finally try something that hopefully will taste like normal bread. You can replace the potato starch with tapioca starch with no problem at all. I do it about half the time. About your choice of flours- it will work but you have to like those two flours. Both are very strong in flavor. To be honest they are my two least favorite but if you like them then it should turn out fine. Both amaranth and buckwheat are somewhat heavy so your loaf may be a little more dense than if you’d have used a light rice flour but again it should be fine. If you are new to gluten free baking know that the day you bake it it will be moist, tender and elastic. The next day will be less so. By the third day… just eat it by then. 😉. Don’t put it in the fridge as that will make it crumbly right away. A quick reply to an old post: I found this recipe via pinterest. It is amazing! Thank you for sharing this simple wonderful glutenfree bread. I made it with teff, buckwheat and cornstarch since that was what I had around and it tastes wonderful! I also did not grind my flaxseeds. Just in case someone arrives on this page and wonders what else might work.